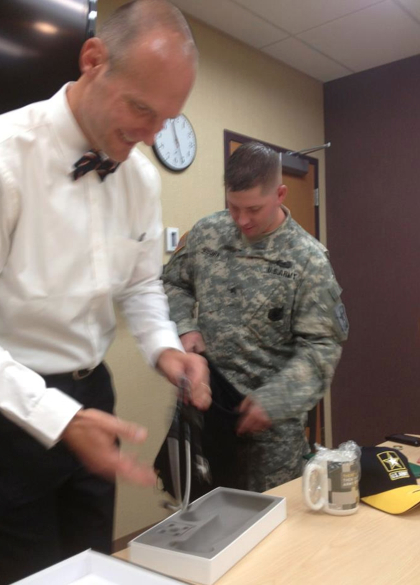 Today, Dr. Thurstone picked up another title: U.S. Army Major. He was commissioned to serve as an officer in the Army Reserves’ 807th Medical Command — specifically in a unit focused on “combat stress reduction.” Dr. Thurstone is the only psychiatrist in the United States scheduled to join our nation’s military in 2012 to help treat active and inactive service members, who report serious mental health needs at staggering rates. The Army alone now is reporting a suicide rate of one solider per day. Here at drthurstone.com, you’ll begin to find much more information about mental health and the military. In the meantime, we invite you to check out a few images from today’s commissioning ceremony at Denver Health and Hospital Authority, one of the hospitals Dr. T. serves. That institution also makes a noble commitment every time one of its staff members joins the military. Thank you Dr Thurstone your service is greatly appreciate. Our military community is greatful for your williness to be part of such of great group of individuals. So proud of Dr. Chris and his family for answering this important call. Our active and retired servicemen and servicewomen are in desperate need. Thank you!